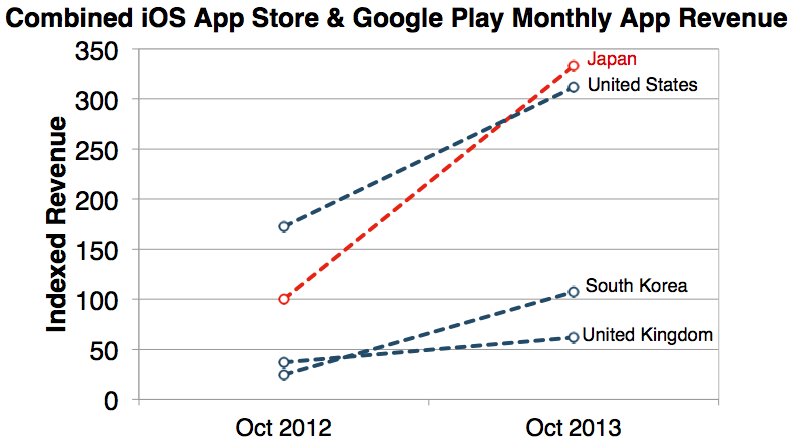 Last year, Americans spent about a third more on apps from Google Play and Apple’s App Store than the Japanese. By October this year, Japan’s 127 million people were outspending America’s population of 310 million by about 10%, according to a new report from App Annie, a research firm. Per capita, the Japanese were spending 2.5 times as much on apps as Americans. What’s driving this growth? Games, games, and more games. In the past year, Japanese spending on games apps jumped 400% and outpaced spending on all other apps (which grew by 30%) by a factor of 15. By contrast, the rest of the world spends only twice as much on games as other apps. A lot of this growth is driven by good old-fashioned television advertising. The biggest hits of the year all saw spikes in downloads after television commercials began to air. 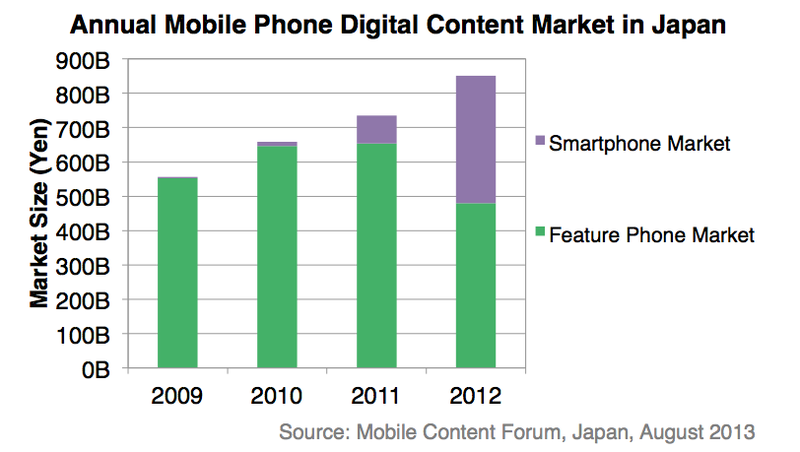 Apart from that, two core factors are behind the growth: the first is Japan’s belated shift to smartphones. Japanese carriers built a world-leading market for data services on simpler feature phones (such as i-mode, launched in 1999), but were slow to start pushing smartphones. That has changed over the past couple of years. Japanese customers have long paid for downloads on their feature phones, and as consumers have shifted over to the new devices, their consumption habits have carried over. The other reason is that the Google Play app store for Android devices operates a carrier-billing model with the biggest operators. This means that consumers can pay for their app downloads as part of their monthly phone bill rather than in the app store itself. According to Google, revenue to app developers jumped almost 14-fold after carrier billing was introduced in Japan. Until last year, Android users in Japan, like their counterparts in the rest of the world, spent less than half as much as iPhone users. By October this year, the two groups were equal, making Japan the only country in the world where Android users spend as much as their iPhone-using brethren.